I’m inspired by this quote from Ray Bradbury each and every time I read it because it’s so bloody bold. It’s confrontational, it’s cocky, and it’s absolutely true. I can be a whiz with every graphics app on my computer but if I can’t provoke my imagination that fancy machine is worthless to me. 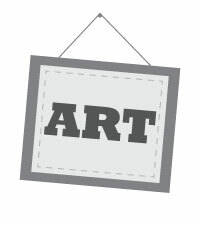 This page features a range of things that I call “art”, from books to license plates, conventions to pubcrawls. These personal projects help to keep me creatively nourished and the skills and techniques I develop along the way always prove useful when I return to client projects. Some of the works on this page are for sale, others are free for you to download and enjoy! All of the material is provided without warranty or guarantee. Please respect my copyright. It’s easy to drop me a line via the contact form at the bottom of the page, however my reply may be delayed if my schedule is hectic. I will attempt to reply as quickly as possible! 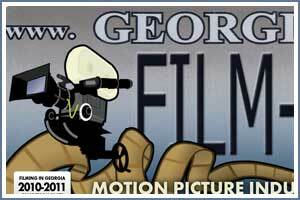 I designed the Film Georgia license plates around 2003 or 2004 and began selling them to my friends in the movie business. This was during the “dark days” of Georgia’s film business, when most Georgia-bound work was diverted to Louisiana due to their tax incentive for film projects. It was my goal to have my license plate design adopted by the state as an optional vanity plate, with the proceeds going to the tourism office or to a scholarship for students studying film in state. Note that these are not state-issued license plates and it is illegal to mount them in lieu of a valid state license plate. Georgia residents may mount them on the front of their vehicles as a novelty plate. These plates are printed onto heavy-duty vinyl with a protective over-laminate using ultra-violet resistant inks and mounted to aluminum blanks, so they’re sturdy. Frequent exposure to the elements will eventually degrade the quality of this artwork and no lifetime guarantee is provided. If you want to make sure that it stays nice keep it inside, out of direct sunlight. Having provided those warnings, these seem to last fairly well on most people's cars and if they wear out why not just buy a new one? Each plate is $20 if purchased directly from me on set or $28 via mail. Buy one (or more!) via PayPal right now! In 2011 I ghost-authored, art-directed and published a book on behalf of one of my clients, Captain Drew, a well-known space pirate. 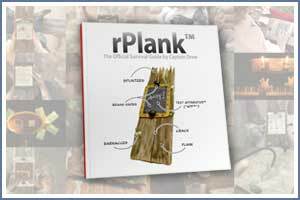 The book is an owner's manual for a product called “the rPlank”, which Captain Drew accidentally invented back in 2010. The rPlank is the pirate version of Apple’s popular iPad tablet computer, but it eschews complicated electronics in favor of simple bolt-on apparatuses (called “apps” for short). The book is available from several online sources including Amazon.com, Barnes & Noble, Lulu.com and as an iBook from Apple. 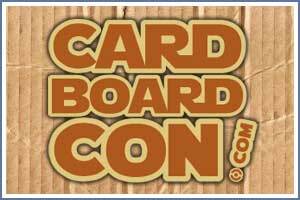 In 2005 I founded the world’s largest all-cardboard science fiction convention in Atlanta, Georgia. It was conceived of as a satirical indictment of Atlanta’s mega-convention, Dragon*Con, but not in a hateful way as some fans might fear. 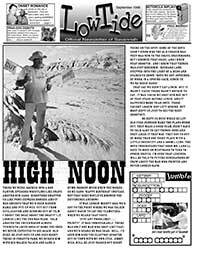 I’ve been going to science fiction conventions since the early 1980s and my first screenplay was a loving tribute to sci-fi costume conventioneers everywhere, so Cardboard*Con is presented as a comically clumsy bizzaro-world version of its inspiration via social media and an elaborate website. The event is even staged halfway across the calendar from Dragon*Con, seemingly setting the two conventions in eternal conflict. Every year the con gets bigger, and when I say “con” I mean it. Despite the panels and presentations mentioned on the official website, Cardboard*Con is actually a pubcrawl through Atlanta’s convention hotels. People who bother to actually read the copy on the website usually have an extra wide grin on their faces as the event unfolds. 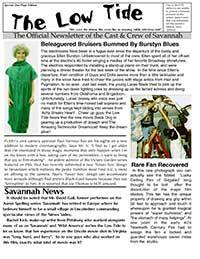 In 2005 an oddly dressed Irish-sounding guy in a mask showed up on my doorstep and started yelling at me about helping him promote a pubcrawl through the city of Decatur, Georgia. He said that his name was “Captain Drew” and that he was a “space pirate”. It wasn’t until he offered me some “cursed” gold coins that I began to take him a bit more seriously. With the influence and good counsel of Tracy Wilson, Fiona Leonard and Geoffrey Brown we helped the Captain get his first pubcrawl up and running, never imagining that it would become such a successful annual extravaganza attracting pirates from around the world every mid-Septembarrrr. 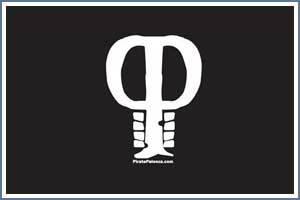 I’m especially proud of the “space skull” logo that I designed for the Captain and every year I sit down with him to create a new shirt for each year’s event. It’s a kick to run into people wearing their shirts, from Dragon*Con to movie sets, the Captain’s influence continues to spread far and wide, and I get to say that I helped! 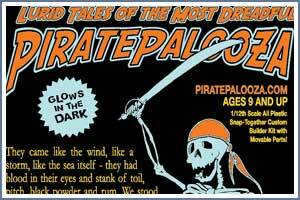 Visit the PiratePalooza Apparel & Gear online store! 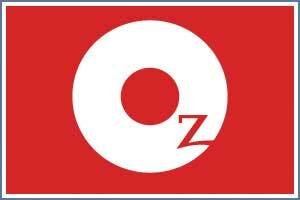 In 2011 I became a featured writer for Oz Magazine, a business-to-business periodical focusing on the film & television industry along with print & new media. My stories tend to focus on humorous behind the scenes anecdotes from motion picture sets and I plan to collect most of them into a book eventually. My favorite stories sound horrific: nearly drowning actors, helping to put out a propane-fueled fire, losing Reese Witherspoon's wedding ring... but they're all actually quite fun and it's been great giving them a wider audience. I enjoy sharing the experience of working on a movie set to an audience who may never set foot in a honeywagon. It's been a great experience working with Oz. Star Wars yearbooks, crazy French teachers, genetic testing, zombie Twinkies. Bloggety blog blog! 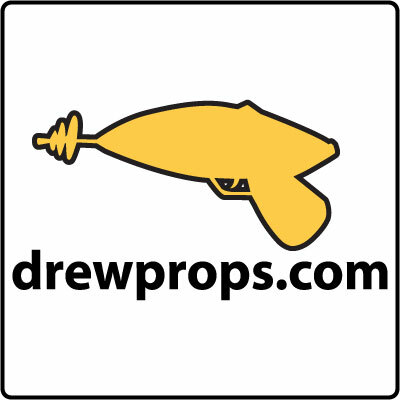 Like the Drewprops.com page on Facebook to keep up with my latest news and to receive occasional posts about interesting design-related stories from around the web. 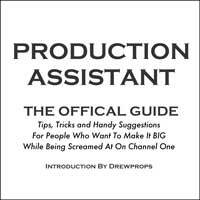 This document is what every new PA should be handed when they first step into a production office. Being a PA is a job not to be taken lightly and too many kids who are eager to storm Hollywood miss out on the essential foundation-building elements illustrated within. Note: only the foreword and revision history were written by Drewprops. This document is under a Attribution-NonCommercial-ShareAlike 2.5 license. 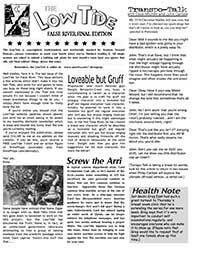 In 2011 I wrote an article for Oz magazine's digital issue called "Go For Jimmy!" 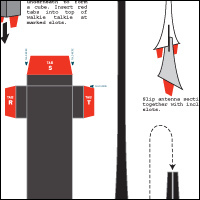 (read more) that featured a paper-craft walkie-talkie that you could actually cut out and assemble and that led to a series of fun toys for all movie crews to use. These items are meant to be printed onto stiff 11x17 paper and require adult supervision. Ask your mom and dad, or a producer or art director to help you with cutting these out! Have fun! Cut out, insert tabs into matching slots, glue all connections, tell extras when to walk into scene. This document is copyright of Drewprops. 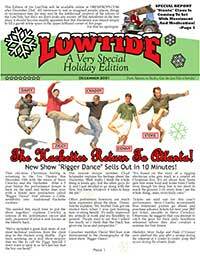 The LowTide was a satirical newsletter that I began producing in the mid-90s for my fellow crewmembers on features and television projects. It was great fun to take film crews and put them into ridiculous situations, and folks on shows really began looking forward to them. The comedic actor David Cross gave me a great compliment on the last day of shooting on 'Run Ronnie Run' and a year or two later I decided to start developing my own material. 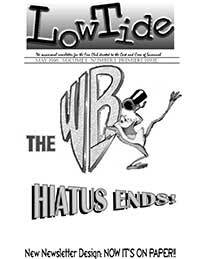 I do rather miss the way that productions would grind to a halt every time that I released an issue. Meet the ‘Thundering Hotties’ and the crazy crew of the imaginary film "We Are Interns" which is based upon and published for the real cast/crew working on the real Warner Brothers film "We Are Marshall". Good Game! The LowTide Struck by Genius. Published for the cast/crew of the feature film based on the life of golfer Bobby Jones. Captain Rob Rules! 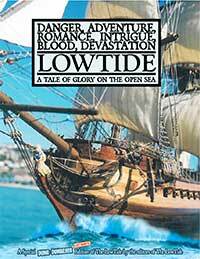 The Dumberest LowTide Evarrrrr Matey!! Published for the cast/crew of the feature film sequel to the movie based on the early days of Lloyd Christmas and Harry Dunn. Felony Melanie Rides Again! The Sweetest Little LowTide y’all. Published for the cast/crew of the feature film starring our own little Reese Witherspoon. Y’all are Brutalizin’ Me! The inbred trailerpark LowTide. 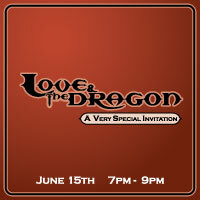 Published for the cast/crew of the feature film based on the character Ronnie Dobbs from the HBO series "Mr. Show". The LowTide Does Five to Ten. Published for the cast/crew of the feature film based on the life of grumpy author Harold Moss. 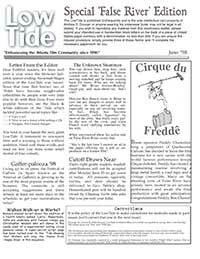 This was the first of two LowTides published for the cast/crew of the strange little independent feature film False River. This was the second of two LowTides published for the cast/crew of the strange little independent feature film False River. Published for the cast/crew of the made-for-TV movie about a boy and his horse. Featuring a young Lucas Black, star of The Fast and the Furious : Tokyo Drift. 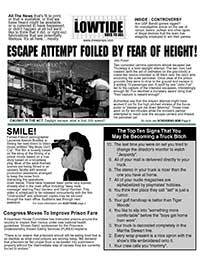 The final of three LowTides published for the cast/crew of the Aaron Spelling television series “Savannah”, filmed primarily in Atlanta, Georgia. 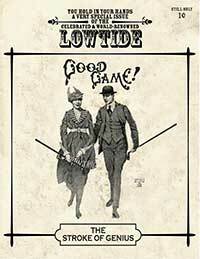 The second of three LowTides published for the cast/crew of the Aaron Spelling television series “Savannah”, filmed primarily in Atlanta, Georgia. 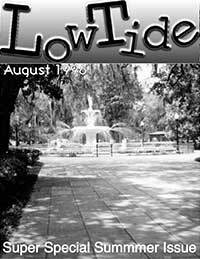 The first of three LowTides published for the cast/crew of the Aaron Spelling television series “Savannah”, filmed primarily in Atlanta, Georgia. Shown below are a few more fun projects I've had fun putting together over the years. All links go to PDF documents. This recipe book was inspired by a blog post in which I retell the story of the time that I completely ruined a piece of steak after misreading the recipe. Call this electronic recipe book “culinary penance” if you will. As with most things I do, I’ve turned a molehill into a 1929 Huppmobile with leather seats and dining car; fancier than originally planned. It’s a very small world if we’re truly only six people connections away from knowing each other. 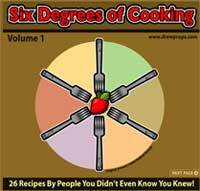 Imagine how far this fantastic recipe book could travel! Remember, if you like it you have to put a few cans into your local food bank. This document is under a Attribution-NonCommercial-ShareAlike 2.5 license. In 2003 I threw myself into writing my first feature screenplay, completing and registering it with the Writer’s Guild as the year drew to a close. After seeding the play to a group of colleagues for input on revisions I was approached by local Atlanta indie-producer Linda Burns to submit the screenplay for the Southeaster Media Award competition. It sounded fun and so we submitted our screenplay package to the competition and were happy to learn that we were one of five finalists who’d be part of a series of readings at the 2004 Atlanta Film Festival. This is the electronic invitation that we sent out to people to come and see our reading. Atlanta filmmaker Lynn Lamousin ultimately won the 2004 competition, but we had a great experience along the way. This document is under an Attribution-NonCommercial-NoDerivs 2.5 license.